A returning feature is the ability to Download Rules. From time to time, new rulesets will be put on the Internet and, in the Festival Plaza, you will be able to download them. 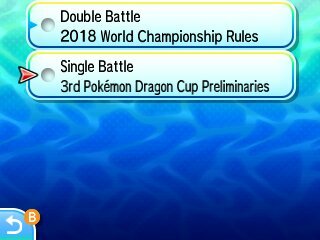 These Rulesets can then be used in all local and online Link Battles that are held with other players. This lets you participate in rules that may not be enforceable outside of Battle Spot or in general. You can save up to 12 downloaded rules at any one time. This ruleset enforces VGC 2018 rules. This ruleset ties in with the 3rd Dragon Cup Preliminaries online competition.